A-Frame Roof - [see image] (also known as Gable Roof) refers to a triangular shaped roof (shape of an A) that may be built with a different roof pitch. Most of barns & houses these days are built using A-Frame roof style construction as a more affordable choice. Anchor Bolt - A bolt used with its head embedded in masonry or concrete and its threaded part protruding to hold a structure or machinery in place. A steel bolt usually fixed in a building structure with its threaded portion projecting; used to secure frameworks, timbers, machinery bases, etc. In construction industry, anchor bolts are used to hold sill plate or beam to the foundation wall. Attic - [see image] Usually refers to the space inside the roof. Note: Attic space in the barn maybe converted into a loft or an apartment. 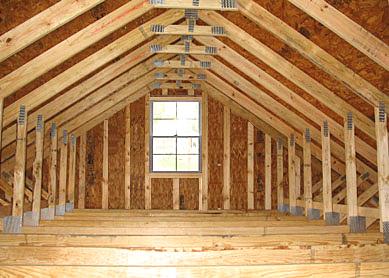 Attic Truss - [see image] A truss designed to accommodate an attic space. Note: Only limited attic space in the center is available when attic trusses are used. Awning - An architectural projection that provides weather protection or decoration that is wholly supported by the building to which it is attached. Note: An awning is usually installed over doorways for better weather protection, or on lower part of roof gable as a decoration. B Exposure - Urban and suburban areas, wooded areas, or other terrain with numerous closely spaced obstructions having the size of single-family dwellings or larger. Exposure B shall be assumed unless the site meets the definition of another type exposure. Bay - The distance between columns or posts along the length of the building, measured parallel to the ridge. Basement - The lowermost portion of a building partly or wholly below ground level; often used for storage. Baluster - Any of the small posts that support the upper rail of a railing as on a staircase or balcony. Beam - A structural member, usually horizontal, used for support in a building and subjected to bending loads. Bearing Wall - A wall that supports a load, like a floor or roof, generally running at right angles to the joists above. Board & Batten Siding - The vertical siding which is built using wooden boards (1x10 or 1x12 in most cases) and strips of wood (2"-3" in width) to cover splices between boards. Note: In some applications (or as a maintenance free alternative) a new composite or vinyl material is used to build siding with a board & batten look. Bottom Chord - An inclined or horizontal member establishing the bottom of a roof truss. Brace - A piece of structural material, either temporary or permanent, serving to strengthen another member, or to hold the member in place. Bridging - Structural blocking used to give an extra stability to floor joists on wide spans. Note: In barn construction, either wooden blocks or metal X braces are used. Building Code (IBC/International Building Code)- A set of regulations established by a ICC (International Code Council) describing design loads, procedures and construction details for structures. 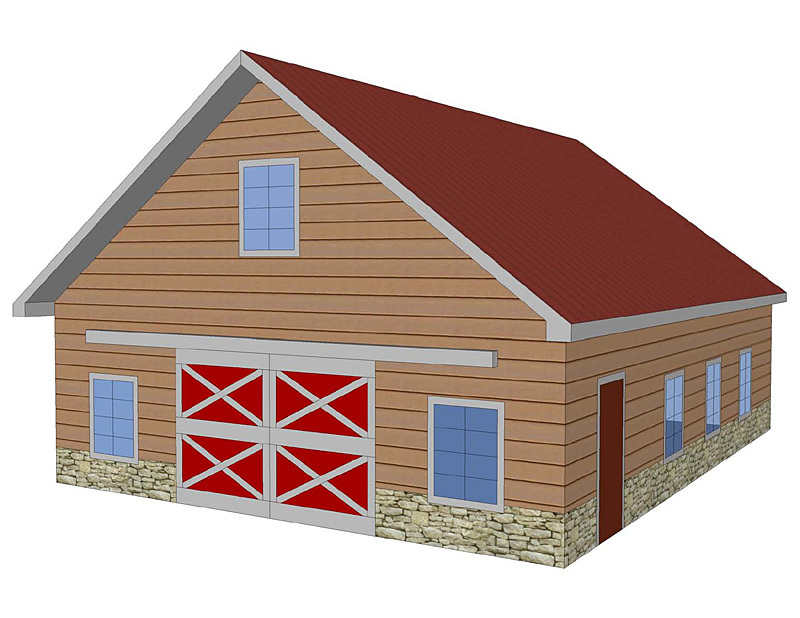 Note: For safety reasons, your should build your barn up-to code even if construction permits are not required. Cantilever - A horizontal projection from a building, such as a step, balcony, beam or canopy, that is without external bracing and appears to be self-supporting. A projecting beam or bracket stabilized by the weight of the wall from which it extends. Ceiling Joists - The horizontal member of the roof which is used to resist the outward spread of the raters and to provide a surface on which to mount the finished floor. A structural member to which gypsum wallboard or other ceiling finishing materials may be attached. Chords (Bottom Chord or Top Chord) - An inclined or horizontal member establishing the top or bottom of a roof truss. Cladding (or Building Skin) - Refers to the exterior building covering. Clear Span - Clear distance between adjacent supports of a horizontal or inclined member. Horizontal distance between the facing surfaces of adjacent supports. Closure Strip - A resilient strip; formed to the contour of ribbed panels and used to close openings created by metal panels joining other components. Typically used underneath ridge caps. Collar Ties - Tie or beam that prevents the roof from spreading; connects similar rafters on opposite sides of the roof. Timber placed horizontally and between rafters that control spreading or sagging of the rafters. Column - An upright supporting member or a vertical structural element that transmits, through compression, the weight of the structure above to other structural elements below. Note: In a barn construction, wooden columns are normally used which are called posts or poles. In pole barns, posts are either pressure treated or laminated. In timber-frame barns posts are usually rough cut untreated lumber. Concrete Footing - Usually refers to the base of the foundation. Footings maybe round (used for pole barns) or continuous (used as the base for cement block foundation). Concrete footings are placed under a column, wall, or other structural member, that is used to distribute the loads from that member into the supporting soil. Dead Load - The weight of the building system construction consisting of all permanent structural members such as framing, weight of the trusses, purlins, sheathing, roofing, ceiling covering, plus all collateral loads. Design Loads - The dead and live loads, which a roof or the floor system is designed to support. Deck - A flat surface capable of supporting weight, similar to a floor, but typically constructed outdoors, often elevated from the ground, and usually connected to a building. In most cases deck is supported by attaching it to the building & set of posts. Deflection - A term that is used to describe the degree to which a structural element is displaced under a load. Dimensional Lumber - Lumber that is finished/planed and cut to standardized width and depth specified in inches. In most cases a dimensional lumber are typically, 2 to 5 inches thick and 5 to 12 inches wide. Dormer - A structural element built out from a sloping roof to accommodate a vertical window. Dual Pitch Roof - A roof that has two sides coming down at a different angle (one side being steeper than the other). Eave - The underside of a roof that extends beyond the external walls of a building or the overhang at the lower edge of the roof. Eave Height - The vertical distance from finished floor to the eave. Eave Vents (Soffit Vents) - Vents installed in the soffit to allow for airflow into the building. Note: For best performance, a ridge vent must be installed in combination with eave vents, since air must flow into the eave vents and escape through the ridge vent in order to create a proper roof ventilation. Endwall - Vertical wall constructed at an end of a structure installed perpendicular to the ridge of the building. Entry Door - A hinged door allowing for access into the building. Fascia - A flat, horizontal board covering the ends of roof rafters; sometimes supports a gutter. Felt Underlayment (Felt Paper) - Paper installed under shingles to protect roof deck from moister infiltration. Flashing - Thin sheet of metal or other impervious material installed to weatherproof or prevent the passage of water into a structure. Flashing is used to seal roof system edges at perimeters, penetrations, walls, expansion joints, valleys, drains and other places where the roof covering is interrupted or terminated. Footing - See "Concrete Footing" for definition. Foundation - The structure that transfers loads to the earth and supports a building. Frame - Structural skeleton of the building including columns, beams, supports and rafters. Frost Line - The maximum depth that frost can be expected to penetrate into the ground. The frost line varies throughout the country. Gable - In general, the gable is a triangular portion of a wall between the edges of a sloping roof. Gable Overhang - The projection of the roof past the endwall. Gable Roof - See A-Frame roof for definition. Galvanized - Steel covered with a protective coating of zinc for corrosion resistance. Galvalume - The patented trade name for the aluminum-zinc alloy applied to sheet steel for corrosion resistance. Gambrel Roof - [see image] A two-sided roof with a double slope on each side, the lower slope having the steeper roof pitch. Girt - A horizontal structural member in a framed wall. Girts resist lateral loads from wind and support wall cladding materials. Girts are supported by the columns and typically pass outside of one or more columns. In Timber-Frame construction it's a horizontal timber that connects posts. Glued-Laminated (Glu-Lam) Post - [see image] A structural timber product composed of several layers of dimensioned lumber glued together. Note: Glue-Laminated posts have better resistance to cracking, twisting and bending compared to a regular wooden post. Grade - Refers to ground elevation around a building. Grade Beam - Perimeter load-bearing support of a structure, either concrete or wooden. Header - A framing structural member crossing and supporting the ends of joists, studs, or rafters. A horizontal beam used as a finishing piece over a door or window. 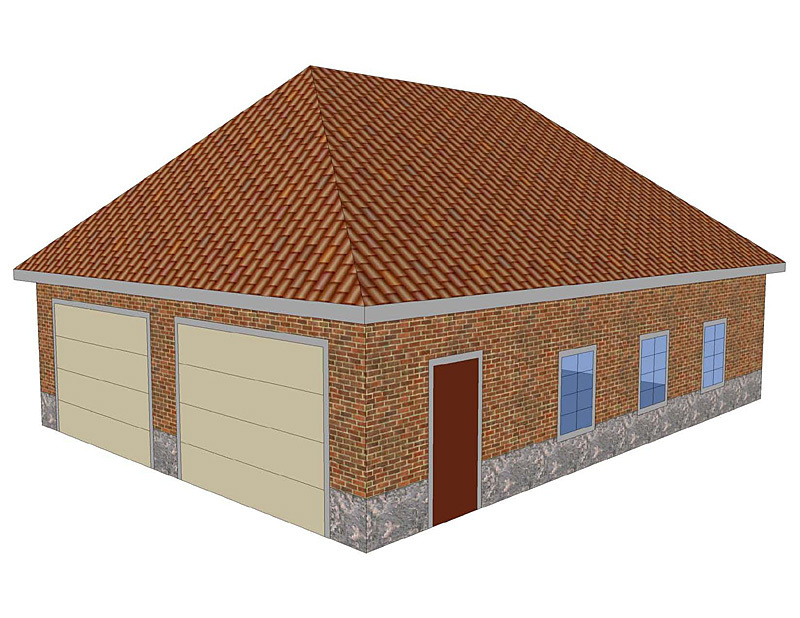 Hip Roof - [see image] A type of roof formed by sloping roof planes on all four sides, with no gables. Hot Dip Galvanized - Refers to a finish that is the result of metal being dipped into a hot solution of zinc to add a protective, sacrificial coating to the metal. Note: When working with pressure treated wood, it's important to use hot dip galvanized fasteners and other hardware. IBC - International Building Codes established by a ICC (International Code Council). Inspections - Review of work performed by a building official. 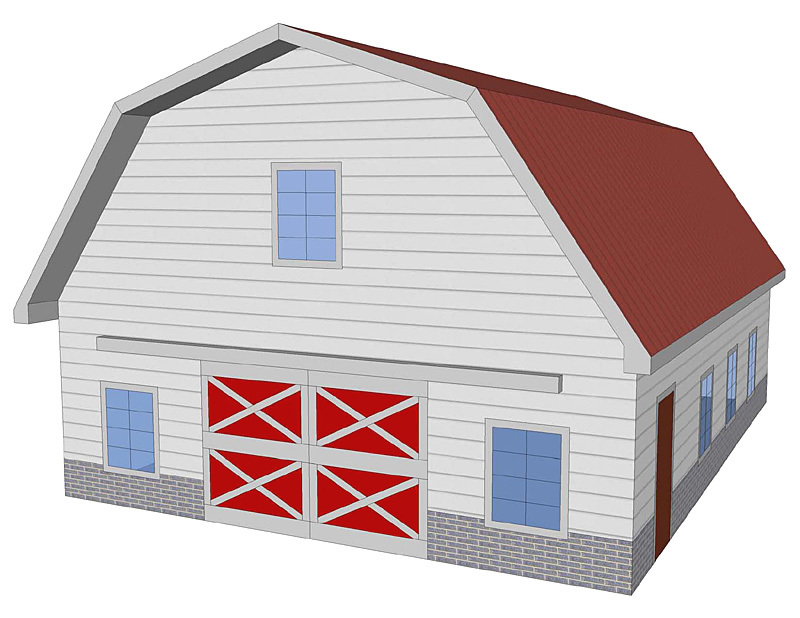 In barn construction (if permits are required), inspections might include foundation inspection (before concrete is poured), framing inspection and final inspection. Insulation - A material that reduces or prevents the transmission of heat. Insulation is measured by R-Value. The bigger the number, the better the building insulation's effectiveness. Jamb - The main vertical members forming the sides of a window or door frame. For example, a door jamb is the vertical portion of the frame onto which a door is secured. Joist - Horizontal structural member running horizontally and supporting a ceiling or floor. In barn construction, floor joists usually run from wall to wall, wall to beam, or beam to beam to support a ceiling, roof, or floor. Joist Hanger - A pre-manufactured metal piece (normally U-shaped) typically attached to a ledger or beam to support a joist. Most joist hangers are galvanized. Note: Hot dipped galvanized joist hangers must be used when working with pressure treated wood. Knee Wall - A short wall-like structure that supports roof rafters extending from the floor to the roof in the second story of a 1-1/2 story house or barn. A structure consisting of posts, headers & braces that supports rafters in mid-span and provides extra stability to rafters & the roof. Lag Screw - A heavy woodscrew with a square or hexagonal head that is driven in with an impact wrench. Laminated Veneer Lumber (LVL) - A manufactured wood product similar to plywood, made in thick sections with all the grain oriented one way, for use as beams. LVL beams are mostly used as headers, but may be used as floor joist or even rafters. Lean-To - A structure with a single sloped roof attached to the side of a building as an extension. Lean-tos may either be open-type (roof supported by posts) or enclosed-type (enclosed with siding). Live Loads - Temporary load that the roof structure or floor structure is designed to support, as required by building codes. Live loads are generally moving and/or dynamic or environmental, (e.g., people, installation equipment, snow, ice or rain, etc.). Lumber Grade - The grade marking consisting of a minimum of five elements to assist the consumer in identifying the (1) Moisture Content, (2) Product Grade, (3) Species or Species Grouping, (4) ALSC-Accredited Supervisory Agency, and (5) Unique Mill Number ID or Mill Name. Masonry - Construction method using materials such as bricks, concrete blocks, ceramic blocks or concrete. Monolithic Concrete Slab - A slab construction in which the footer and the slab are poured as one piece. Such slab acts as both, the foundation & the concrete floor. Mortise and Tenon - A strong joining technique method where the projecting (tenon) of one piece fits into the opening (mortise) of the other piece which are then held together in place by wooden pegs, glue, bolts or screws. On Center (o.c.) - Distance from the center of one member to the center of the other member. Studs, joists and rafters usually spaced 16 inches or 24 inches apart. OSB (Oriented Strand Boards) - Structural wood panel made of layers of wood chips laminated together with glue under extreme pressure. OSB is often used as a substitute for plywood in the exterior wall & roof sheathing applications. Peak - The highest point of the roof. Pitch - See Roof Pitch for definition. Plywood - An engineered wood panel consisting of multiple layers of wood glued cross-directionally to provide a greater dimensional stability. Post - A rectangular vertical structural supporting member, used to construct building's side walls and end walls. Posts transfer loads from main roof beams, rafters and/or trusses to the foundation. 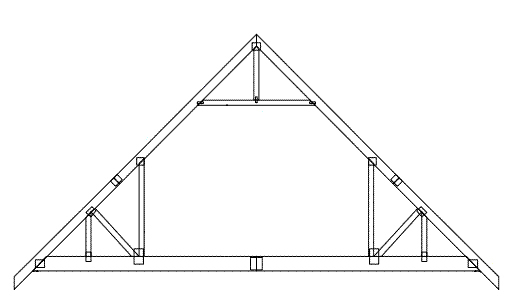 Post Frame Building (Pole Barn) - A structure that has framing system built of wood roof trusses or rafters connected to vertical columns or sidewall posts and which also has secondary structural members such as wall headers, roof purlins and wall girts to support the exterior cladding and to transfer vertical and horizontal forces to and from the post-frame. Pressure Treated Wood (P.T.) - Wood subjected to a high pressure treatment of chemicals as a preservative. Preservative is applied under pressure to penetrate deep into the wood. Pressure treated wood resists rotting, insects and harsh outdoor conditions. PSF - Pounds per square foot. Purlin - A horizontal structural roof member spanning between beams, rafters or trusses, and to which the roofing material (corrugated roofing or plywood and shingles) is attached. In post-frame construction industry, 2x4 SPF purlins are placed on top of trusses usually 24" o.c. to support metal roofing material. Pier (Concrete Pier) - A column of masonry or other structural material, either round or rectangular in horizontal cross section, used to support other structural members. In some applications, concrete piers may be used as a foundation for barns & other buildings. Perma Columns - [ see image] Precast concrete columns that take the place of treated wood in the ground and are used mostly in pole barn construction. Rafters - Sloping roof structural members spanning from an exterior wall to a center ridge beam or ridge board. 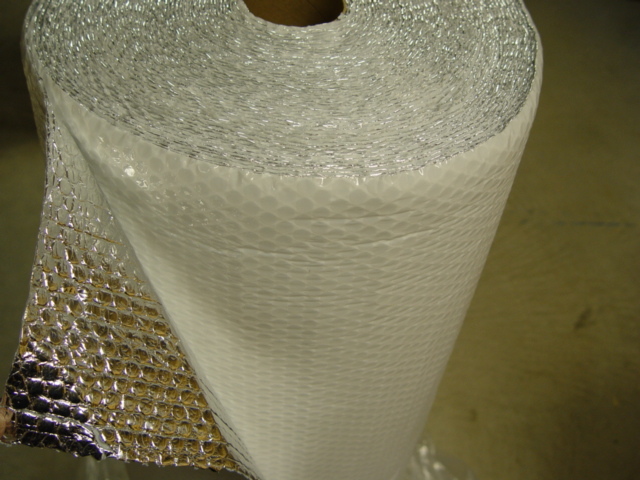 Reflective Insulation - [see image] (also known as double bubble insulation and condensation barrier) Thin layer of insulation material with reflective foil surface (on one or both sides) and air bubbles inside. Primarily used under metal roofing and behind metal siding to reflect heat away from the building. This type of insulation is also used under metal roofing as a condensation barrier. Ridge Cap - A continuous material designed to cover the ridge of a roof. Ridge Vent - Refers to the vent installed at the peak of a sloped roof allowing warm, humid air to escape a building's attic. For best performance, ridge vent must be installed with combination of soffit vents (eave vents). Ridge Board (Ridge Beam) - Horizontal structural member that's sandwiched between rafters and serves as a support in the highest point of the roof structure. Roof Overhang - The extension of the roof beyond its bearing support, providing extra shade and weather protection. Roof Peak (Ridge) - Horizontal line running the length of the building at the highest point of the roof. Roof Pitch - Relates to the slope and inclination angle of a roof in building construction. If the roof has 8/12 pitch, it means that for every 12 horizontal inches the roof goes up 8 vertical inches, commonly expressed as 8/12 roof pitch. A 12/12 roof pitch is 45 degree slope. Roof Snow Load - Gravity force acting on a structure due to the weight of snow. Snow load also includes any necessary accounting for drifting or sliding. Roof Truss - A prefabricated structural roof component built with timbers & metal plates and designed to give clear spans between the external supporting walls. Trusses are used to build a roof skeleton. Scissor Truss - [see image] Roof truss designed with a bottom chord sloping upwards to an interior peak at the center of the building. Sheathing - Exterior covering of a building's walls or roof. Skirt Boards (Splash Boards) - Pressure treated lumber installed at grade line to which the bottom of the building siding is normally fastened to. Sliding Door - A door that slides on a horizontally attached steel track by means of trolleys and rollers. Soffit - The underside surface of a cornice or an overhang. Soil Pressure - The load per unit area a structure will exert through its foundation on the soil. Span - Horizontal distance or interval between two points. Splash Boards (or Skirt Boards) - Pressure treated board installed at grade line to which the bottom of the building siding is fastened to. Note: Splash boards are normally used in post-frame building (pole barn) construction. Static Loads - Result from the weight and/or pressure from equipment, livestock, and stored products and the materials used for construction and maintenance activities. Stud - An upright wall member such as 2x4 or 2x6 to which exterior or interior covering material is attached. Stud Wall - A wall built using the combination of vertical studs & horizontal bottom & top plates. In stud wall construction, studs are generally placed 16" or 24" on center. Stud wall may either be load-bearing or non load-bearing. Tensile Strength - The strength of material expressed as the greatest longitudinal stress it can bear without tearing apart. Timber - Wood cut and prepared for use as building material. Top Chord - Inclined or horizontal structural member that establishes the upper edge of a truss, which also carries compression and bending stresses. Toe Nailing - Driving a nail at an angle so that it penetrates through one piece into another. Transit (Building Level) - An instrument used for determining grades and elevations, rough angle turning, laying out and leveling foundations, setting forms, leveling walls, setting lines, setting offset stakes and much more. Truss - See "Roof Truss" for definition. UBC - Uniform Building Code - First published by the International Council of Building Officials to promote public safety and standardized requirements for safe construction. UBC was later replaced in 2000 by the new International Building Code (IBC) published by the International Code Council (ICC). Uplift - Wind load on a building which causes a load in the upward direction. Vapor Barrier - A watertight material such as film, plastic, foil or coated paper that is used to control condensation and prevent the passage of moisture into or through floors, walls and ceilings. Ventilation - The natural or mechanical process of supplying conditioned or unconditioned air to, or removing such air from, any space. Wainscot - Material on the lower few feet of a wall or walls, divided from the upper portion of the wall. Used primarily as an aesthetic feature. However, if using steel panels for wainscot, provides ease of replacement of future damaged or dented panels. Web - Structural member joining the top and bottom chords of a truss forming the triangular patterns. Wind Load - The lateral pressure on a structure in pounds per square foot, due to wind blowing in any direction. X-Brace - An X shaped brace is used to increase the stability and wind load of the building structure. X-Braces made of cable are used on steel buildings on walls & roof. On pole barns X-Braces built of 2x4 lumber are often fastened on inside of roof trusses for extra stability. Zinc-Aluminum Coated - Steel coated with zinc and aluminum for corrosion resistance.